On 2 July, 2011 large areas of the city of Copenhagen were flooded in a cloudburst. Copenhagen is on the front line of climate change, experiencing increasingly heavy rain events, as they are also on the leading edge of urban innovation with a vision of transforming their city into a sustainable, C02 neutral city by 2025. 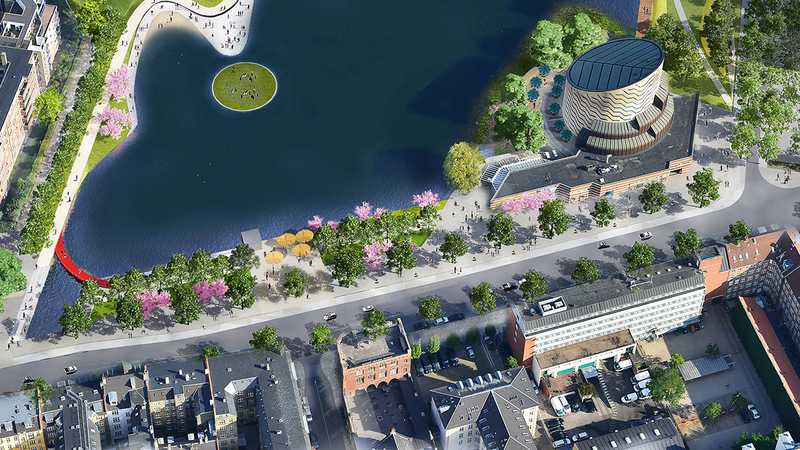 The City of Copenhagen and Greater Copenhagen Utilities (HOFOR) assisted by Cowi have developed a general and citywide cloudburst masterplan that divides Copenhagen and Frederiksberg into catchments to found the basis for the specific master planning and project identification. The plan was prepared under the administration of Mayor for technical and environmental affairs, Morten Kabell. For 4 of the initial specific catchments Ramboll and Studio Dreiseitl - in cooperation with the City of Copenhagen, Greater Copenhagen Utilities (HOFOR), Frederiksberg Municipality and Frederiksberg Utilities - proposed a vision and concepts that became boiled down into 3 masterplans covering more than half of the more than 300 projects in the two cities; Copenhagen and Frederiksberg. These plans are based on an un-paralleled city-wide use of integrated planning and implementation of blue-green infrastructure, that have inspired planners on an international basis. This new generation of blue-green infrastructures addresses essential city services such as mobility, recreation, safety and biodiversity, creating a strategic and feasible approach to ensure long-term resilience and economic buoyancy. Luke Strickland and Stuart Divall of Ramboll UK review some of the flood mitigation measures implemented in the Danish capital since its cataclysmic flood in July 2011. Can such an approach be transferred to the UK? Over the next 30 years, Copenhagen will implement an ambitious cloudburst masterplan and a number of concretisation plans to protect the entire city against the damages of heavy rain. Climate adaptation comes with a cost, but the cost of doing nothing is far greater. And the projects can be carried out in a way so they create value.